A new study by Ebay Business found that seventy percent of online entrepreneurs are not able to profile their business on the Internet. Search engine optimization (SEO) is crucial for the success of a business and many entrepreneurs are missing out on sales they would otherwise receive. 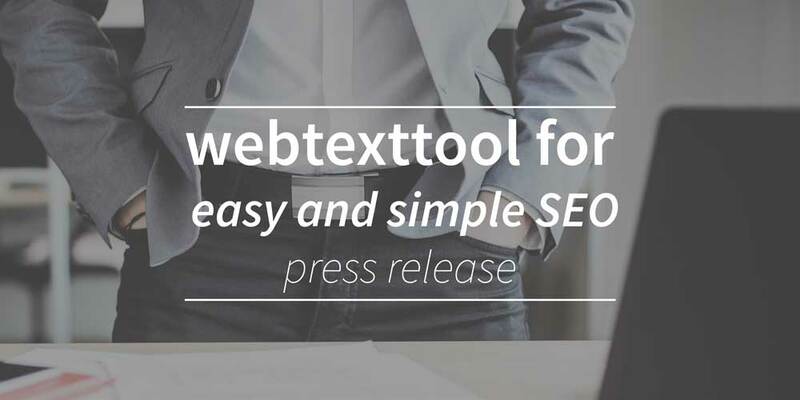 In an effort to improve the sales of these businesses, Webexttool has created a do-it-yourself tool that allows businesses to write optimized text that will rank well on Google and other search engines. The tool has successfully helped entrepreneurs in the Netherlands and is set to release in the United States today. In the same Ebay Business study, it was found that forty percent of entrepreneurs rely on the Internet for sales, yet they don’t know how to find customers online. Additionally, while some businesses hired companies for SEO help, others simply did not know what to do. With a clear need for SEO education, Webtexttool collaborated with Ebay Business to create a webinar for Dutch businesses, in an effort to improve online visibility. Webtexttool is a Dutch startup with a goal of making search engine optimization available to everyone. The do-it-yourself tool helps business owners to write content that is optimized for search engines. Unlike other SEO tools, Webtexttool is simplistic and accessible to people who don’t know much about technology. Additionally, the team at Webtexttool keeps users up to date with a blog that outlines a variety of articles involving SEO and the latest techniques. It is projected to grow exponentially in upcoming months.